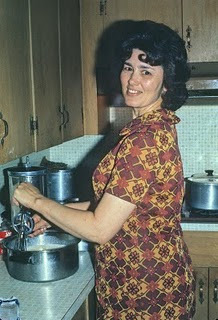 This is my Grandmother, Mary Denton Ault. I lost my Grandmother way too early in August of 2004 to cancer. Today my thoughts & prayers are with all those families that have been touched by cancer. Those who have lost loved ones, those who are still fighting & those that are cancer survivors. My wish & prayer is that one day all will be survivors, that a cure will be found & that cancer will no longer take family members way too soon. Unfinished Blankets & Snuggle Weather. I have kept the faith.'" some finished and some unfinished. that she had started when I was a baby. She had just finished it just for me. one for Zach, one for Cailey & one for Rylan. (Cara & Cole weren't part of our family yet). & she wouldn't be able to get them finished. Most of you know I am not the seamstress. but I was determined to get the quilts finished for my Grandmother to see. I got the kids to help me with them. We sewed the good sides together leaving a little gap open around the edge, then flipped them around, put batting inside, sewed up the hole and then tied each quilt with white yarn. Not as fancy as my Grandmother would of done, but we did the best we could. Zach has a fire truck blanket, Cailey has a pink rosebud blanket (Grandmother said because she had rosebud lips when she was a baby!) and Rylan has a Little Boy Blue blanket. Before Grandmother Ault passed away I took a picture of the kiddos with their blankets & put it in a frame for her to keep. I know it made her happy seeing the kids with their "Grandmother Ault" blankets all finished. As the years have passed the blankets have been folded up and put away. Until Miss Cara came along. :) Since she was a little baby she has loved Cailey's Grandmother Ault blanket. It has now been named by Cara as “my flower blanket”. Each night when I tuck Cara in she says, "I want my flower blanket touching my skin." So I always put that one on first, then her warm blanket on top. :) On cold days like today she loves to snuggle up on the couch with her flower blanket & watch TV. When my Grandmother Ault left this earth, she might have left a few unfinished blankets, but with the things that really counted she left nothing unfinished. She was an amazing women who loved the Gospel & her family. She was strong, faithful and the best grandmother in the world. She knew how to do anything. She was always a phone call or a visit away. I knew she loved me, and I am so blessed to be her granddaughter. I miss her everyday, but I know one day I will see her again. I know now that when she looks down from heaven she can see her little great granddaughter who she never got to meet in this life all snuggled up & warm in her Grandmother Ault flower blanket. I'm sure it warms her heart.